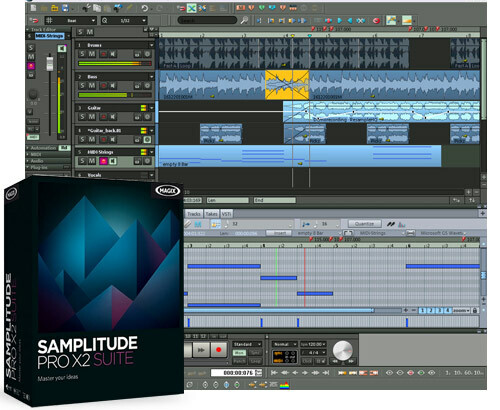 Samplitude Pro X2 Suite combines the outstanding features of the Samplitude Pro X2 audio workstation with a high-quality add-on package. The precise audio engine with full bit transparency guarantees 100% neutral sound. Discover the unique possibilities offered by real-time editing, individually customizable interfaces, an optimized workflow, and high-quality mastering tools. And that's not all – Samplitude Pro X Suite also includes the Analogue Modelling Suite Plus, Vandal guitar and bass amplifier as well as the Independence Sampler with a 70 GB Premium Library. All these components transform your system into a powerful all-in-one solution covering all stages involved in sophisticated audio productions. • Includes comprehensive additions: Analogue Modelling Suite Plus, Vandal guitar and bass amplifier and Independence Sampler Workstation, including 70 GB content! Professional audio processing from recording to mastering – realize your creative ideas with Samplitude Pro X2 Suite. As a purely native digital audio workstation, Samplitude Pro X Suite is independent of proprietary audio hardware and can be used on a comprehensive audio workstation as well as on a laptop.